This paper discusses a key learning element in an agent-based model of early sensorimotor learning during the first month of life. The system is based on the hypothesis that the earliest learned habits are driven by affectivity (innate non-objective preferences) and are grafted onto innate sensorimotor habits. The agent demonstrates the ability for learned associations, gradually overriding innate reflexes and producing learned voluntary motions. Additionally, the agent exhibits learned avoidance behaviors that could override innate affective preferences and reflexes . The key learning element discussed here is an enhanced three-layer avalanche chain network. Avalanche chain neural network theory  was originally developed by Grossberg to model motor learning based upon a psychological model. He presented a conceptual mathematical schema for these systems. In this work, we report a specific implementation of the system. One finding of this work is that the original 2-level Grossberg topology must be extended to a 3-level system to deal with interruptions and unanticipated changes in the affective state of the agent. Specific sets of mathematical equations implementing robust avalanche chain learning are presented. 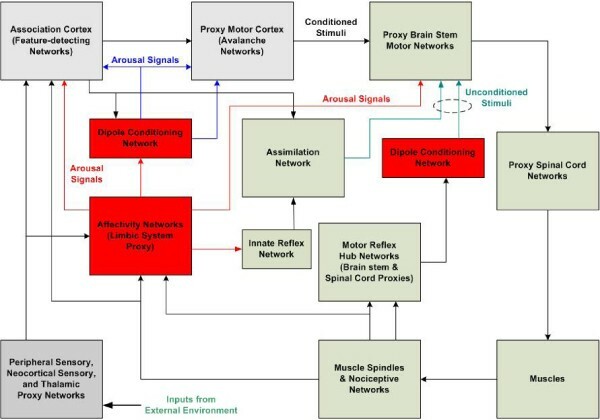 The avalanche network proxies functions of the motor cortex and lower level motor networks (e.g. in brain stem). Its learning dynamics are aroused by signals generated in a proxy limbic system and associated dipole-network conditioning functions . Pre-set innate motor reflexes supply the unconditioned stimulus and learned responses are formed by mimicking these primitive reflexes (see Figure 1). Over time, the learned associations gradually take over control of motor movement execution by means of a simple assimilation network. This paper deals primarily with the learning dynamics of the 3-level avalanche. Block diagram of learning agent. This work was supported by the National Science Foundation, award # 0648202.